Toyota Corolla Powertrain Performance Pros and Cons | Page 1 of 1 | Why Not This Car? They try to moderate the price you pay in power by gearing if you press the accelerator all the way but the gear ratios are not smooth. Performance was very sluggish. Part of the week I had it involved a long drive at highway speeds and the engine noise is extremely loud at 40mph or higher. I drive a CVT equipped Lancer that is much quieter and performs great. I didn't buy this car for performance. It has a very small engine and is not fast at all. Not very smooth, however it emphasizes driver comfort. I was able to learn stick very quickly on this car. Clutch releases toward the top, to minimize mistakes by driver. Gearing isnt strong, but powerband is very linear through 1st, 2nd, and 3rd gears. Burns oil and power is not as when purchased. engine and transmission well matched, needs a bit of gas up the hill but is generally excellent for its intended purpose. The XRS trim comes with a 170hp Celica GT-S Motor with VVTL-i. Surprizingly zippy and decent pick up for a small 1.8L motor. Although a sedan, it drives like a sports car (not an AC Cobra) with top notch handling and plenty of power. Even with my foot in it I get 27 MPG overall and mostly 30 MPG. 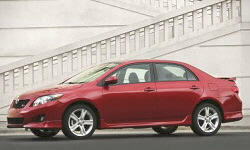 Comfortable and lots of trunk room while having Toyota reliability.